Lift Service, Inc. has one of the most skilled and knowledgeable service staffs in the industry. Our staff has combined experience of more than 300 years in the field of industrial equipment. We have a fleet of radio dispatched service trucks that are even capable of making hydraulic hose in the field. We offer quality service on any make or model of lift truck, man-lift, sweeper, scrubber, skid-steer loader, tow tractor, golf car, personnel or burden carrier, or industrial engine. We offer qualified service on gasoline, LP Gas, diesel, or electric powered equipment. We have daily trips throughout our authorized sales territory that is represented on the territory map. We cover the entire spectrum of mobile equipment maintenance with total preventive maintenance programs, field repairs, and repairs in our shop. Our preventive maintenance programs are very comprehensive. We handle everything from the actual maintenance to scheduling and maintenance record keeping. The scheduling of maintenance intervals and record keeping are done at no cost to our customer. For field repairs, we have a well qualified staff of mobile technicians that will come to your site. We are capable of handling just about any repair short of a major overhaul at your job site. 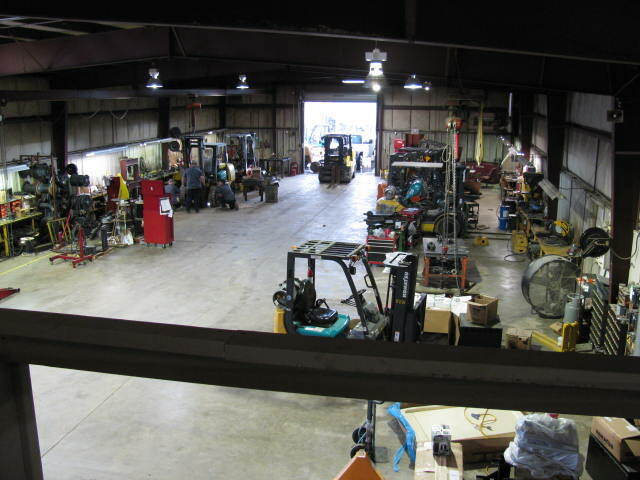 We have an excellent shop facility that is equipped to handle any repair you might need. We offer repairs ranging from total overhaul of engines and transmissions all the way to a stem-to-stern restoration of the entire vehicle. We also offer quality painting for the customer concerned about the appearance of their equipment. Give our service manager a call about any service requirement you might have on material handling equipment. You will not be disappointed.